This is a reconditioned kirby Sentria vacuum. 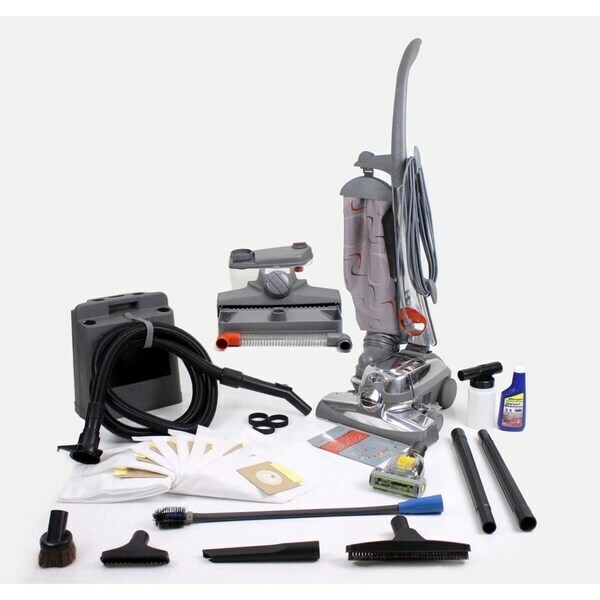 Comes with new deluxe GV attachments,12 foot crush proof hose, horse hair floor tool, GV turbo brush mini nozzle with geared belt and spinning brush roll. This works great as a tool for vacuuming up pet hair, stairs, mattresses, upholstery and cars. This will also come with a tool caddy, hand held shampooer, 9 new 3M style HEPA bags, 4 new GV belts (one installed), 1 12oz bottle of kirby Shampoo that you will use with the hand held shampooer, and an inflator/refrigerator coil cleaner. Includes the Popular Kirby shampooer system! Kirby's are great because they have awesome cleaning power, filtration, and are very durable. This will come exactly as pictured. We are in no way associated with the Kirby company. All refurbishment of this vacuum and its warranty has been done through GreatVacs and not the Kirby co. or its associates. Since none of the work refurbishing this vacuum has been done by the Kirby company this vacuum is not considered "Factory Rebuilt" or "Factory Refurbished". To purchase a "Rebuilt" or "Factory Rebuilt" or "Factory Refurbished" Kirby vacuum, please contact the Kirby Company. Some of the Attachments, Brushrolls, Belts, Tool Caddies, and Bags may be standard vacuum parts and not purchased from the Kirby company. All other parts used to recondition this vacuum by GreatVacs are Genuine Kirby Parts purchased from the Kirby company.